Awesome Ellicottville retreat! Cozy up after a day of enjoying the outdoors in our 2+1 bedroom cabin with 1.5 baths with hot tub and wood burning stove. Our cabin is perfect for couples and families, it sleeps six total with children and is ideal for up to four adults. An AC unit was recently added to the cabin keep cool in warmer weather. This is an ideal location to spend time with family this summer - enjoy the river in the back yard, hike Allegany State Park, visit Holiday Valley Sky High Adventure Park, hike the area, enjoy local festivals, relax with an outdoor bbq and evening fire (campfire wood not provided), enjoy antique tours, spas, shopping and dining in the quaint village of Ellicottville. Regardless of what activities you enjoy, they are all easily accessible from this cozy country cabin. Please note the cabin is not available mid-November through the end of March during ski season. We welcome guests again starting in April. This cozy cabin is our getaway and we are happy to share it with you. 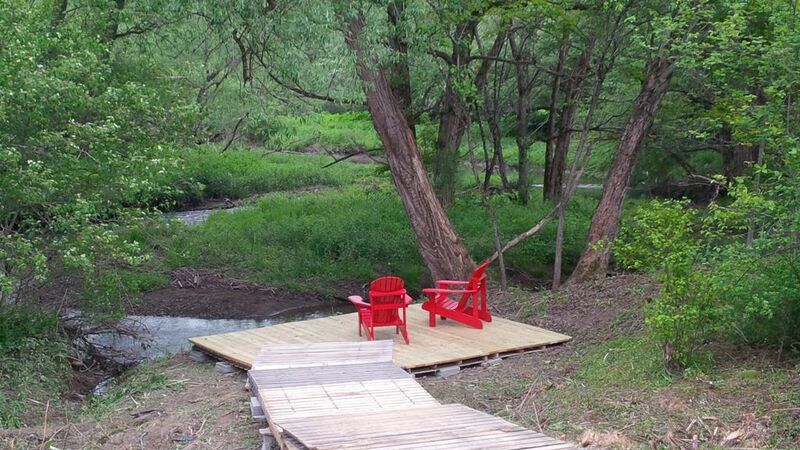 Small deck overlooking a winding river. Portable AC unit cools the entire cabin in warmer weather. Soap, coffee filters, spices, sugar, cooking oil, paper towels provided. Small fold out table provided just off kitchen- can fold out to seat 6. Projector and screen available for watching movies on DVD. Small television and DVD player in the master bedroom. Handful of books to enjoy. Spacious yard overlooking trees, hills and winding creek. Perfect for lawn games and campfires. Relax on the riverside dock. Holiday Valley 4 miles away. Great getaway families and couples. Plenty of hiking and mountain biking nearby at Holiday Valley and in the Allegany Forest. Enjoy stand up paddling at Spruce Lake. The town of Ellicottville has great shopping and restuarants. Many antique shops in the area. Or just relax on the deck and enjoy the quiet and the view. Finish the day with a soak in the hot tub or an evening fire. Our cabin has a well stocked kitchen, sheets and towels. Washer and dryer on site for your use in our mudroom/laundry room. Beautiful property. Pictures do not do it justice. Very spacious and stocked with everything you need. Ellicottville is an amazing little town. The people are nice and friendly! Wonderful stay... looking forward to ski season! Very quiet and relaxing stay! Very impressed with the cleanliness of the cabin and the hot tub which we used a lot while there. Has everything needed for a comfortable stay without having to worry about bringing extras. Would love to go back in the fall to see the area during peak fall foliage, which must be breathtaking. Ellicoteville is a very nice small town with restaurants, breweries, and wineries! This house was so perfect! There was 7 of us with a bachelorette party and we were trying to find the perfect place to stay that also wasn’t breaking any of our checkbooks. It is only a 10 minute drive from the town of Ellicottville which was so convenient when we had to do unexpected trips for more alcohol :) We did the sky park aerial adventure at holiday valley which was again only 10-12 minutes away. The hot tub was 100% our most favorite part!!!! We used it a couple times each day. Michelle supplied everything for us - kitchen stuff, towels, sheets, blankets...it was awesome and made our packing for 2 days that much easier. There were ceiling fans throughout which made it feel great in the house during the day and especially at night. There is a projecter screen to play movies on and the ONLY complaint I have about this place is that there is no booklet from the company or the owners on how to use the projecter itself. We had put movies on our phones to watch and connect to the projecter but we couldn’t figure it out. There were some DVD’s there that we could’ve watched but unfortunately, only 2 out of the ~7 had the actual DVD present...all the others were missing. We tried going to Tops but they did not have what our bride was looking for. Slight bummer but definitely not a deal breaker on staying here again! We will just bring DVD’s with us next time. Thank you so much Michelle and Ivan for being so great. We can’t wait to return! Glad you enjoyed your stay. The instructions for DVD/projector were in the welcome manual. Thank you for letting me know our DVDs have gone missing as we were not aware. A friend and I spent a quiet weekend at Michelle's place! She was very quick to respond to all of our questions, before and during our stay. The cabin rules were clearly outlined and available before our stay. The property is so cute! We spent quiet mornings out on the deck and evenings relaxing in the hot tub. We had some difficulty figuring out all the lights (there are lots of switches), but Michelle responded quickly to my questions. Only regret is that I wish I had brought more DVD's to use in the projector! We also ventured into Ellicotville, which is a very short drive away, and enjoyed our experience at the bars/restaurants there. Overall, we loved our time here and would definitely stay again! My husband, three children and I all had the recent pleasure of staying at this little cabin for a long weekend, and we had a very positive experience--definitely recommend! It's located in a beautiful rural setting (I imagine the fall foliage is incredible) yet it's just a few minutes away from the Village of Ellicottville, so you're a stone's throw from the restaurants, grocery store, etc. Far enough removed to enjoy the peace and quiet of nature, but not so remote that you're spending all of your time in the car. The house is cozy, and sleeping arrangements are perfect for a family with children--one large queen with a private bath; a cozy private loft (for our 12 year old) and a set of bunk beds (perfect for our 10 and 7 year old). Despite being in a very rural area, the house has wi-fi, which in this day and age is hard to live without. We were also permitted to bring along our very well-behaved golden retriever, which was a *huge* plus (I stress "very well-behaved", as those are the only types of animals who should stay here--don't ruin it for future guests with animals who have accidents or are destructive!). Melody was very comfy here and was constantly in search of critters in the backyard! The highlight of the house for our kids was the hot tub--they thought it was the greatest thing in the world, and spent a lot of time lounging in it! There's also a fire pit for campfires (which we had) and a swingset, also enjoyed by the children. We hope to be back and make this a regular getaway. I definitely recommend (and wouldn't do so if I didn't believe it was of good quality--believe me, I'm picky! ), particularly to families. The house is clean, well-appointed and central to some fun things (check out Rock City for hiking, and definitely go to the Ellicottville General Store & Diner to order the "sweet and salty" breakfast--then sneak upstairs to snoop through the antique store!). Thanks Michelle for the great stay!